Predator 2 is the kind of Hollywood sequel that just had to be made. The 1987 Arnold Schwarzenegger-starrer made oodles of profit at the box office, and Twentieth Century Fox simply couldn’t resist a follow-up, even if it meant proceeding without Schwarzenegger, who was arguably the most profit-inducing component of the original. 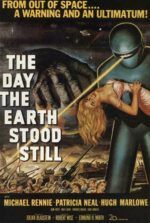 The result contains typical sequel tropes, all revolving around the idea that bigger is—for indeed all intents and purposes—better. So the result has more violence, a larger body count, more details about the alien hunter race, more Predator weapons, and ultimately more Predators. The story takes place in the future of 1997, a time when, from the perspective of 1990 when this sequel was made, it seemed possible that gang violence would completely overrun Los Angeles in the coming years. Shifting the story from the sweltering jungle in Predator to the ozone-depleted big city here, the setting becomes a turbulent one where cops are overpowered by ruthless crimelords in the streets, and high above the Predator watches through his infra-red vision, playing audio recordings to itself over and over. As Schwarzenegger opted to make Terminator 2: Judgment Day instead of this, and every other action hero on the list (Stallone, Swayze, Willis, etc.) was busy with their respective projects, the protagonist is played by Danny Glover, whose popularity at this point was best known as Mel Gibson’s sidekick in two Lethal Weapon movies. 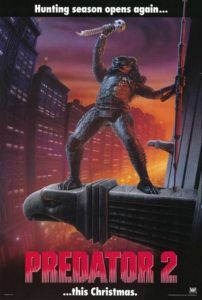 But the human star doesn’t matter in Predator 2, not when it’s the creature alone on the movie poster. Glover plays the no-nonsense Lt. Harrigan, a violent cop of such ridiculous skill that he single-handedly ends a street war that has been raging for hours when the movie opens. 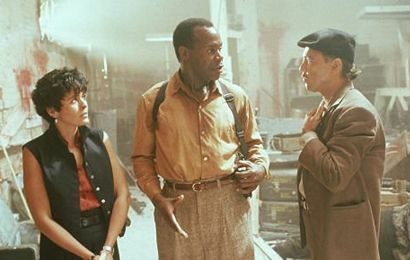 Along with his team—made up of Danny (Rubén Blades), Leona (Maria Conchita Alonso), and the self-absorbed ‘new guy’ Lambert (Bill Paxton)—Harrigan attempts to find out who’s been killing both sides of a Colombian-Jamaican gang rivalry. This mysterious third party has been stringing up either side’s victims after skinning them alive. Taking over the investigation is FBI suit Keyes (Gary Busey, offering no end of cheesiness) and his band of men in black, who collectively keep Harrigan from finding the killer. But then, the audience already knows the culprit comes from the alien race of hunters who kill for sport, yet it takes most of the movie for Harrigan to figure that out on his own. Taking a cue from Aliens, James Cameron’s sequel which epitomizes the idea that bigger is better when it comes to sequels (even though Ridley Scott’s original remains far superior), the sequel to Predator ups the ante not by expanding on the original, but by lifting ideas mostly straight from Aliens. 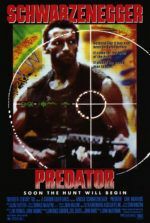 Take the slaughterhouse sequence, where Keyes and his FBI goons attempt to infiltrate the Predator’s feeding ground, while remotely, FBI Agent Garber (Adam Baldwin) watches in shock as the Predator kills the other Agents. Harrigan, meanwhile, shouts at Garber to “get them out of there!” Sigourney Weaver’s Ripley did much the same to Lt. as they both watched on video the elite unit of Colonial Marines was attacked by Xenomorphs in Aliens. And then there’s Predator 2’s hotshot cop Lambert, played with incomparable cockiness by Paxton, whose performance recalls his role as the whining Hudson in Aliens, all except for the “Game over, man!” defeatism when faced with death. The plotline of this sequel follows the original closely in its basic structure, in that the hero slowly discovers he’s being hunted and ultimately proves himself more capable than the alien Predator. Very little new information is communicated to the audience, aside from a new-fangled Predator gizmo or two. When, in the last five minutes, Harrigan chases down the Predator to its mother ship, he discovers that the alien hunters have been around for centuries, a reveal that offers nothing more than a “Huh, imagine that” reaction. 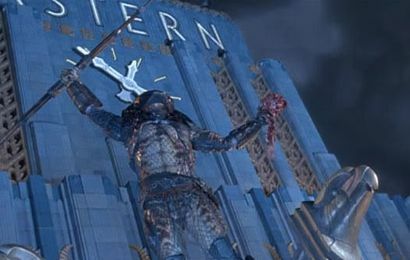 The filmmakers were content to remain annoyingly faithful to the formula of the first, despite the changes in leading man and locale (the latter seemingly for the sole purpose of showing the Predator atop a skyscraper gargoyle, being struck by lighting with a victim’s spinal column in-hand). Further drawing from the Alien franchise, creature designer Stan Winston, who developed the Predator creature and several designs for Cameron’s Aliens, insisted on mounting a Xenomorph skull on the Predator ship in the finale of Predator 2. While understandable that the filmmakers sought to illustrate how the Predator was a daring hunter capable of stalking the most dangerous beasts across the galaxy, the decision inspired an entire line of Alien vs. Predator merchandise and media. For that alone, it’s worth a feeling of Why did you do this to us? towards Predator 2. Though commercially sound, the Alien vs. Predator franchise has proved nothing but disappointing, from a string of underwhelming video games to the unbearable movie spin-offs Alien vs. Predator and AVP: Requiem. Director Stephen Hopkins, whose experience when hired was only A Nightmare on Elm Street 5: The Dream Child, turns what was an action franchise into a bloodbath of horror. Heads are removed, limbs are chopped off, and whole bodies are skinned in gory detail. 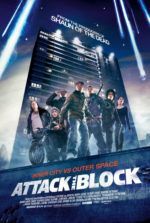 With so much violence that the MPAA stamped the outcome with the dreaded NC-17 rating, the movie was drastically trimmed to earn its ‘R’. This concentration on horror proves an unfortunate derivation from the original’s actioner style purveyed by director John McTiernan, who followed up Predator with Die Hard and The Hunt for Red October. Hopkins would not be so fortunate, making Lost in Space and The Reaping in the coming years, but his stain on the franchise would go on to transform Fox’s Predator audience into a horror crowd (until it was returned to its roots in 2010). Watchable in the most mechanical sense, Predator 2 is capably shot with admirable special FX and mind-numbing violence, but strangely enough, not in the satisfying way that could be said (using the same words) about Predator. Its failure ultimately killed the franchise for over a decade, with the dreadful Alien vs. Predator resurrecting the movie monster, but no Predator 3 to follow until twenty years later. The screenplay by Jim and John Thomas, writers of the original, once again look to Fox’s Alien franchise for inspiration; but instead of doing something innovative, their imitator qualities become apparent and squander all hope for mindless entertainment value, despite the limitless possibility. It’s a disappointing sequel in all the ways audiences have come to expect from Hollywood, leaving us indifferent to the film’s mediocrity.